Don’t be fooled, colloidal silver sprays and creams won’t benefit your health. In the continuing trend of the New Zealand media advertising ineffective health products as though it’s news, stuff.co.nz has published an article pushing colloidal silver for treating infections and skin conditions. Ionic colloidal silver is anti-bacterial, anti-fungal and anti-viral. It supports the immune system when the body is under attack and micro-organisms cannot build up resistance to it. It’s also completely safe for every single person in the family to use, babies included. all over-the-counter (OTC) drug products containing colloidal silver ingredients or silver salts for internal or external use are not generally recognized as safe and effective and are misbranded. Colloidal silver has been on my radar for quite some time now. Here in New Zealand, it’s been promoted for various conditions: predominantly infections and skin conditions, but also extending as far as cancer. The evidence for its efficacy is equally absent for all of these claims. In 2013, I got in touch with another company promoting colloidal silver products in New Zealand, “Health House”. I wanted to know what evidence they had to back up the claims they were making. In particular, I wanted to know if they had any evidence that came from the product being tested in vivo, i.e. in a living organism. Much of the evidence used to back up health claims about colloidal silver products comes from in vitro testing, as opposed to being tested in people or animals. This is dangerous; many many potential new drugs may appear effective in in vitro tests but then turn out to be ineffective or worse, unsafe, when tested in animals or people. So if we rely on this low quality evidence to make health decisions, we run the risk of using ineffective and/or harmful products. Unsurprisingly, the response I received from Health House was that that they don’t have any credible evidence to back up their claims. As well as telling me this, they also decided to send me a list of (anonymised) customer testimonials. In my opinion, this is a very deceitful tactic. Relying on incredibly low level evidence to back up health claims, and promoting them alongside testimonials which can be both misleading and very convincing, is not an ethical way to promote a healthcare product or empower patients to make informed decisions. That said, it is also a very common tactic among promoters of colloidal silver and other ineffective health products. Using health testimonials in advertising is prohibited in the Medicines Act for this very reason, although that provision is hardly observed and barely enforced. As well as saying colloidal silver can treat various conditions, promoters like Skybright also claim it is safe. In her quote for the stuff.co.nz article, Ms O’Halloran even said it was safe for use on babies. As far as I’m aware, that’s essentially true, but with one big caveat. The reason it’s true is that it’s only legal to sell colloidal silver in New Zealand if it’s at too low a concentration to have any effect. Rodney Hide: is Medsafe permitting colloidal silver manufacturers and promoters in New Zealand to distribute material containing therapeutic claims; if so, why; if not, what has it done to stop such distribution? Annette King: No. Distributing material containing therapeutic claims for colloidal silver products would breach the Medicines Act 1981… Colloidal silver products containing less than 10 parts per million of silver do not need consent to distribute under the Medicines Act providing no therapeutic claims are made. Therefore, once references to therapeutic claims have been removed and as long as the product contains less than 10 ppm of silver, there is nothing to prevent these products being advertised again. Even if colloidal silver was able to treat infections, at a concentration as low as 10 ppm it would be surprising if it had any effect. Luckily, those effects you’ll be missing out on include your skin turning permanently blue. 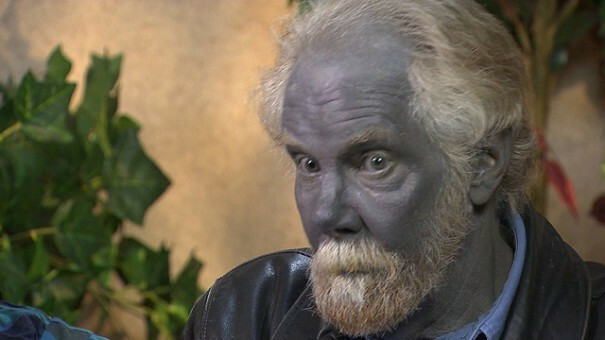 Paul Karason, probably the most famous sufferer of argyria caused by colloidal silver. More cases of harm caused by colloidal silver can be found documented on the website whatstheharm.net. One sufferer of argyria caused by colloidal silver, Rosemary Jacobs, has written about the dangers of colloidal silver and the ignorance of some naturopaths promoting it. While legally sold colloidal silver products aren’t likely to be harmful, there is a real potential for harm if you’re going to make your own colloidal silver. DIY “make it yourself” colloidal silver kits aren’t hard to find for sale online, including on sites like Trade Me. I honestly do worry that someone is going to read that it’s safe for babies, and wind up using some colloidal silver someone made at home which is far more concentrated than 10 ppm. On a lighter note, it just so happens that my favourite bit of New Zealand pseudoscience comes from an ad for Skybright’s colloidal silver cream, so of course I just have to share it here. When you see as much quackery as I do, it helps to be able to laugh at it on occasion. Is this a scentific peice or an opinion peice? How about you scientists (or is it bloggers) do studies to back up your claim or the claims of othets you’re referencing. Hi Anaru, thanks for commenting. I’ve tried to be pretty clear regarding which parts of my article have been based on fact and which are my opinion. I also try my best to always provide links where appropriate. Is there any part of my article in particular that you think is unclear? When it comes to why I don’t do studies on colloidal silver myself, I don’t think it’s a good use of my time or money. I think a more relevant question would be why those who make a living from selling colloidal silver products (or any of the many other health products sold in New Zealand that aren’t supported by evidence) don’t fund studies to find out if the claims they make are really true. I assumed you would be interested in doing a serious study seeing as you’ve taken the time to write the article. The don’t be fooled headline suggests some certainty but your peice clearly state there have been no high quality studies. This just stinks of personal bias which is not very scientific at all. Perhaps even less scientific than the evidence to support it. 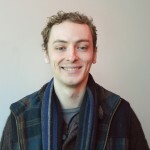 Conducting a clinical trial is quite an undertaking, being an activist and hobbyist science communicator it’s not something that I have the resources or expertise to undertake. Colloidal silver isn’t the only thing I’ve written about for which health claims that aren’t supported by evidence are made either. My goal with this article is more to help people avoid being misinformed by companies like Skybright, who make health benefit claims about colloidal silver products which aren’t backed up by evidence. Although it’s true that there’s no good evidence either way due to a lack of studies, in my view there’s also little plausibility that these products can have any positive health effects. Particularly given the miniscule 10 ppm maximum dose at which they may be sold in order to not contravene the Medicines Act, I’m comfortable in saying that any colloidal silver products legally bought here is not going to provide any health benefit. Interesting article – thanks for posting. Something that has been on my radar/concern for a while, since a few of my friends and family have used colloidal silver formulations for a long time and seem to find them useful (not sure how much of this is actual benefit vs placebo effect etc). How does this link in with evidence relating to the antimicrobial properties of silver itself? You could expect or extrapolate that topical formulations of colloidal silver could be effective – is there any evidence for this or has it been formally tested? Thanks James. I think the matter of silver really having antimicrobial properties is part of the “danger” of colloidal silver. What looks like a grain of truth makes it much harder to dismiss out of hand than something like homeopathy or “quantum reflex analysis”. To my knowledge, which is aligned with the conclusions drawn by NCCAM, there simply isn’t any high quality research that’s been done on the health effects of colloidal silver. Particularly at the low concentrations it’s available legally in New Zealand, I expect any perceived result is likely to be attributable to the various confounding factors that make health testimonials so unreliable. The placebo effect, as you’ve mentioned, is one of these. But there are also other things to consider such as confirmation bias and regression to the mean. 2. Claims which go against the best available evidence. Colloidal silver falls into that first category, which I don’t think is as unethical as the second. But making health claims without a solid justification for doing so, especially when standing to benefit financially from the claim, is still unethical. Who knows, maybe one day there will be high quality evidence about the health effects of colloidal silver which let us draw reliable conclusions about whether or not it’s effective (and effective enough to justify its safety profile) for any particular treatment. But I’m not holding my breath on that one. In many ways, it reiterates the important role that we have as a scientific community to synthesise and communicate validated information on the claimed benefits of health products. This is especially important for those in your first category where there is little evidence as yet to actively disprove claims, but where those that stand to gain financially from selling these products exploit the naivety of there customers with bold marketing claims – this isn’t always sinister, as I suspect that many of those who sell and market products like colloidal silver probably sincerely believe that it works. We can of course help by providing accessible and understandable information on the evidence to the public – as the marketeers have shown, persuading consumers with the right information in the right way is probably a key to reducing demand and changing the game. If someone claims that a particular substance has medical properties surely it is up to them to prove their claims not up to other people to disprove them? Would a drug company be allowed to put a drug onto the market and leave it up to the consumer to prove whether it works or not? What does the FDA have to do with NZ? They’re an internationally recognised and very credible regulatory body. Colloidal silver isn’t going to be less ineffective when used in New Zealand than it is when used in the USA. Apparently claims that the stuff doesn’t work are just bought & paid for by the pharmaceutical industry, according to a fairly prolific commenter on that particular page.